(From Nikon lens literature) With the latest addition to Nikon’s popular f/1.8 prime series of FX-format lenses, Nikon has announced the new AF-S NIKKOR 35mm f/1.8G, a versatile fixed lens ready to thrive in any shooting situation. The new 35mm f/1.8G lens rounds out a collection of acclaimed f/1.8 lenses including the AF-S NIKKOR 28mm f/1.8G, AF-S NIKKOR 50mm f/1.8G and AF-S NIKKOR 85mm f/1.8G lenses. Sporting the popular 35mm focal length and covering a 63 degree angle of view with a f/1.8 maximum aperture, Nikon’s newest FX-format lens delivers outstanding viewfinder clarity and high contrast while providing outstanding low-light performance and depth of field control. 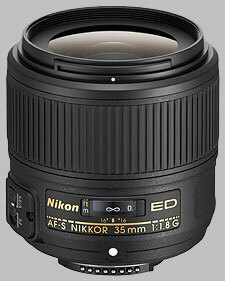 The AF-S NIKKOR 35mm f/1.8G lens will be available on February 20, 2014 for a suggested retail price of US$599.95. It's sharper and it has better contrast than the AF 35mm f/2D. I'm not sure if it's as good as the Sigma 35mm f/1.4 Art, but it's definitively more compact and lightweight. I like how this lens handles/feels on a Nikon camera body. Ergonomics are great. Sharpness, color, and contrast are very good. This lens renders like my other AF-S lenses (28mm f/1.8, 50mm f/1.8 and 85mm f/1.8). When you look in the corners at 100% magnification on your high resolution screen, you'll find softness wide open, but when you stop down it gets sharper. CA is very low and the lens doesn't flare easily. Autofocus is reasonably fast, silent and very accurate. If you are looking for a compact and lightweight walk around lens, this is a very nice option. I think it's a good upgrade from the older AF-D version and it's so much more comfortable to carry around than the large, heavy and expensive f/1.4 alternatives from Nikon and Sigma. I took this lens with a bit of skepticism since it costs 550 € and having already the Sigma 35 1.4 and the lightest 35 f2.